Peanut Butter Chocolate Chip Blondies are the chewy, decadent dessert to bust out any time of year. 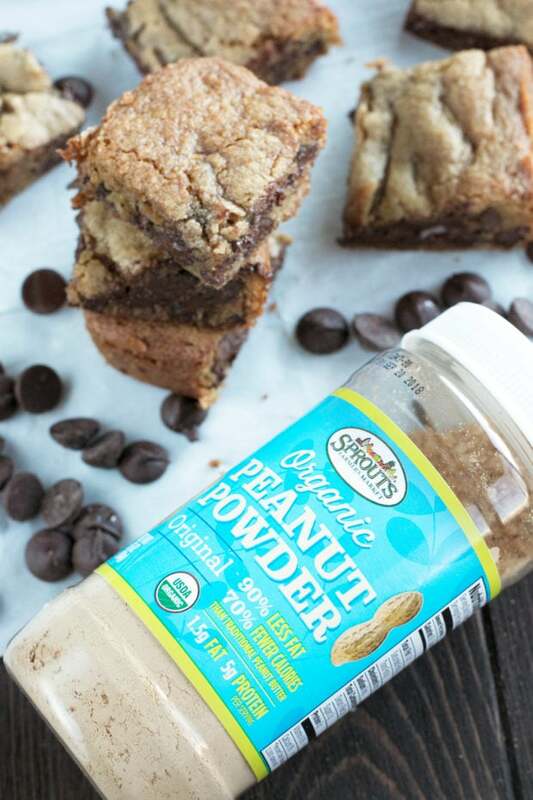 With the secret addition of peanut butter powder to make these gooey bars a little healthier, they are easy to make and even easier to eat. Heyyyyyy peanut butter and chocolate lovers… You feeling hungry? 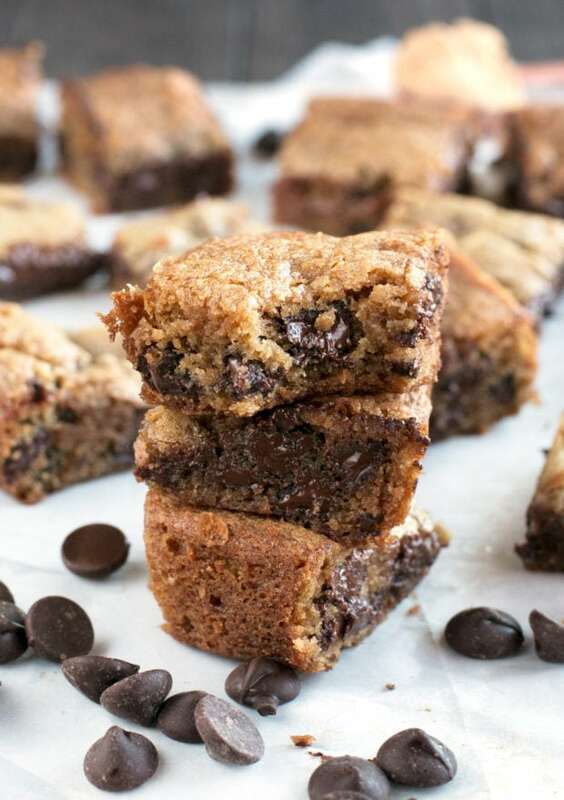 Because I have a chewy, gooey treat to help perk you right back up – with a little surprise inside to make ’em healthy! Let’s talk about peanut butter. It’s creamy, it’s delicious, it’s full of amazing flavor. It’s comforting, it’s delightful, and it’s one of my favorite things to start my day with, even if it’s just a spoonful to satisfy a craving. Now, let’s talk about something that’s gonna blow your mind. I had never heard of this amazing product until Sprouts introduced me to it. It’s a brand new product they are launching and it’s, simply put, quite amazing. 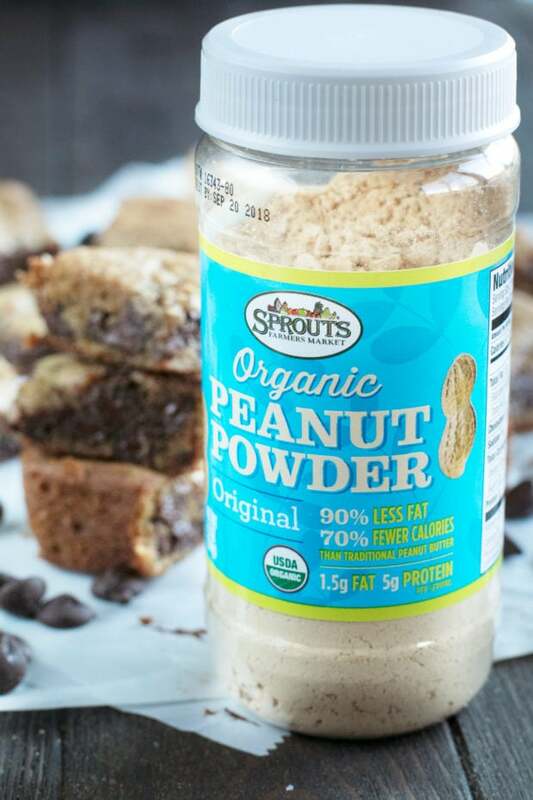 Peanut powder adds all of the peanut flavor you know and love, but without the oil so it’s healthier. 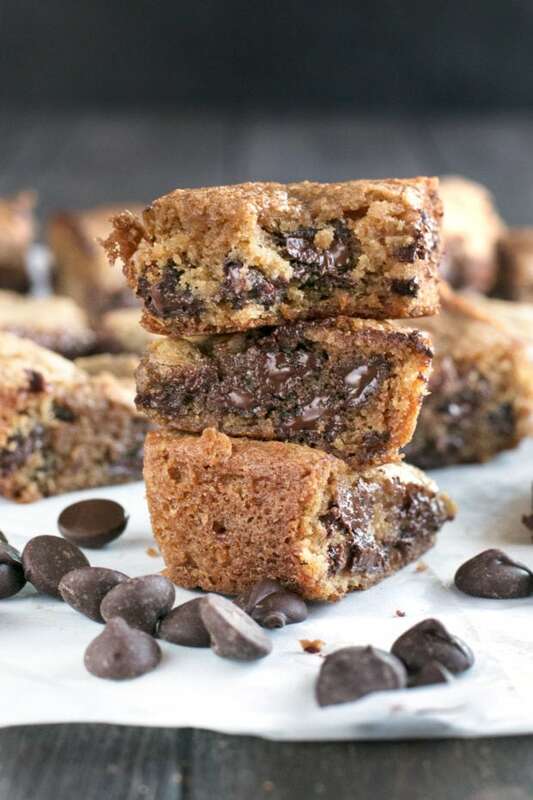 It also packs a punch of potassium and magnesium to tons of different recipes, just like it does for these gooey blondies. 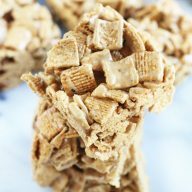 You won’t believe the creamy peanut butter flavor you get from it! 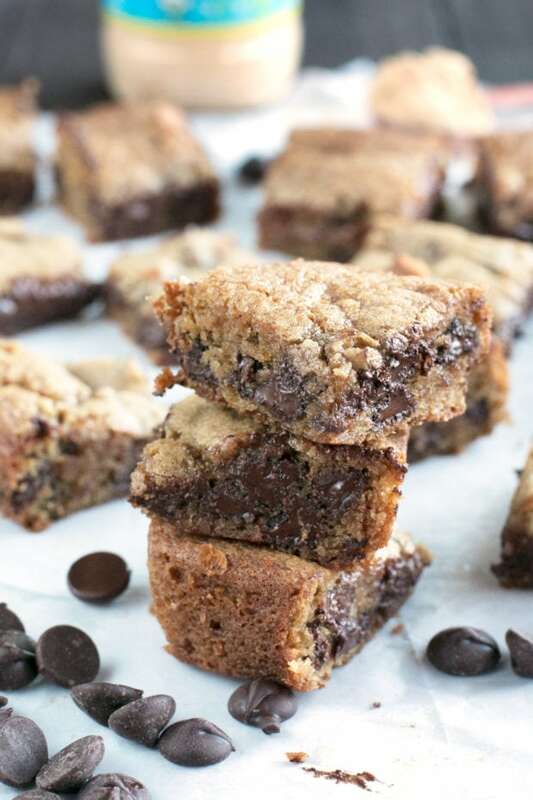 It really gives these blondies the best texture ever, making them even more decadent than the blondies you’ve made in the past. 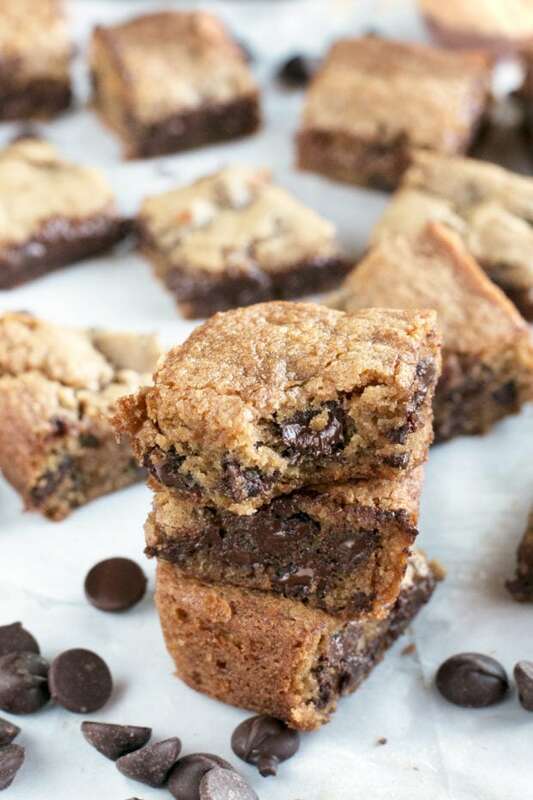 So next time you are craving a peanut butter and chocolate treat, reach for a glass of milk and a couple of these oh-so easy-to-make blondies for the ultimate in sweet satisfaction. 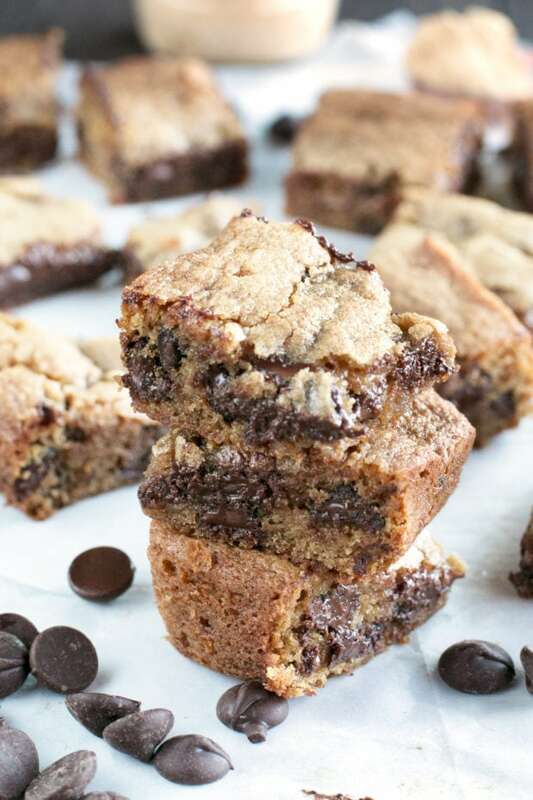 Pin this Peanut Butter Chocolate Chip Blondies recipe for later! 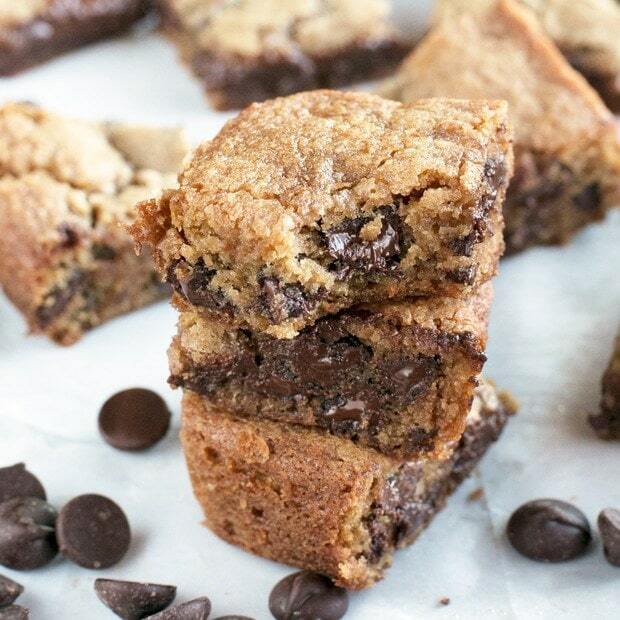 Chewy, decadent peanut butter chocolate chip blondies are an indulgent dessert recipe made healthier with peanut butter powder! 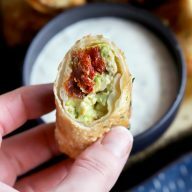 Easy to make, and even easier to eat. Preheat oven to 350 degrees F. Line an 8"x8" baking dish with parchment paper and set aside. In the bowl of a stand mixer, cream together butter and sugar until fluffy, approximately 2-3 minutes. Add egg and vanilla. Mix until combined. Add Sprouts Peanut Butter Powder and water. Mix until combined. Add flour, baking soda, and salt. Mix on low until just combined. Add dough to the baking dish and smooth top. Bake 30 minutes, or until the top is golden brown and a toothpick inserted into the center of the dough comes out almost clean. Cool for 20 minutes in the pan. Remove from pan and cut into 9 squares. Serve warm. These look amazing, but I’m not gluten free, so I’ve never used gluten free flour. Would you use almond or coconut flour? Or can you use all purpose flour? All in equal amounts? 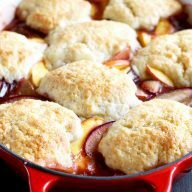 You can use AP flour! I tested it the other day actually and it works great (same amount and everything! )!